Remember Vanessa Carlton? Chances are the name rings a bell, given the fact she shot to fame with her plinky plonky piano-laden single A Thousand Miles in 2002 (trust us, you'll know it when you hear it). As we all know, the heaving beast that is the internet cannot truly slumber until it has spat out mash-ups of every possible song combination in existence. 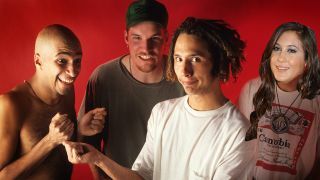 With that in mind, it seems inevitable that someone has mashed up Carlton's song with Rage Against The Machine frontman Zack De La Rocha's incendiary Killing In The Name vocal performance. Like most of these things, the results work disarmingly well – so much so that it's probably better than Carlton's original, but we'll let you guys be the judge of that. Bonus points for the extra David Draiman 'Ooh-ah-ah-ah-ah'. Check out the video in all its glory below.